Sleek, stylish, and all-around protective folio with adjustable stand for the Samsung Galaxy Tab S 10.5. 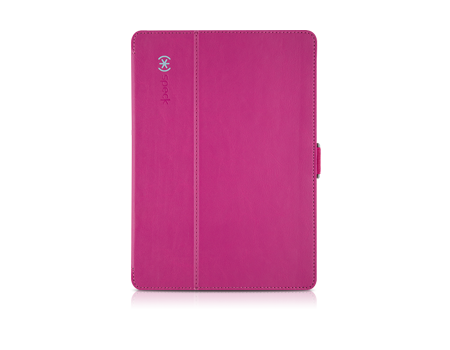 Meet our most popular tablet case: StyleFolio, an upgrade that’s as functional as it is good-looking. The smooth, vegan leather finish and slim, protective construction provides a sleek and form-fitting design. The fully backed perimeter shell is complemented with a protective, soft microfiber inner liner to make sure your tablet can stand up to accidental bumps, drops, and scratches, letting you breathe a sigh of relief. Full perimeter hard shell and anti-scratch liner. StyleFolio’s all-around protective hard shell keeps your Galaxy Tab S 10.5” snug and scratch-free with a soft inner lining to save your Samsung tablet from accidental bumps, drops, and spills. Vegan leather cover with seamless design. Vivid colors and high-resolution patterns garnish StyleFolio’s easy-to-clean vegan leather cover, making your Galaxy Tab S 10.5” look better than ever with a seamless, impeccable design. Auto wake/sleep. Integrated magnets wake and sleep Galaxy Tab S 10.5” on open and close. Secure closure clasp. A locking clasp in chic color accents secures your Galaxy Tab S 10.5" when either folded open or shut for when you’re on the go. Multiple viewing angles. Reading? Typing? Re-watching that funny YouTube video? You’ll be sure to find the perfect angle for you with the multiple viewing positions and convenient typing mode. Acoustic speaker scoops. Integrated, sealed speaker scoops acoustically project sound toward the user to improve sound quality and amplitude.